Though my fiancee' doesn't believe me, I really hate being late to things. Well that is I hate being late to things I know I shouldn't be late to like weddings, funerals, business appointments, and speaking engagements. But when it gets to things like conferences, who cares when you get there? Well apparently the people I tend to travel with (but fortunately all of them are very reasonable). While I was staying in Sacramento area, I and several more laid back compatriots decided to skip the morning sessions of a conference we were attending in favor of recuperating from a fairly crazy week of running around, while we let those set on going to the morning sessions go ahead of us. 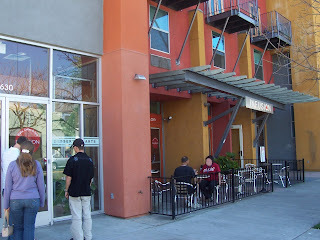 This new window allowed for a nice coffee stop at Infusion Cafe, a Sacramento coffeehouse that little blue birds had sung several positive melodies about (i.e. I had heard good things). So on the way to the conference, we find it fairly easily in a very neighborly section of Sacramento. The entire structure that houses Infusion really catches your attention with its bright colors and attractive design. The inside further elaborates your senses, with beautiful designs, furniture, and even an illustrious fish tank. The coffee comes from Zoka out of Seattle, a fairly widely-used roaster who manages to usually produce a stellar coffee (sadly, I had a friend bring me back a bag of Zoka from Seattle earlier that year, and it tasted so-so and a little over-roasted). The coffee in turn sampled well, though if I recollect correctly it did taste a little stale (foul on the barista). The espresso also came out tasty, though I can't remember being wowed as I had expected to be (maybe my expectations over-sensitized my tongue?). The tea was free leaf and while I didn't try it, it looked decent. Infusion goes on the list of places I want to go to again to give it another go, for I don't think I caught them at their best. If you stop by, let me know what you think.